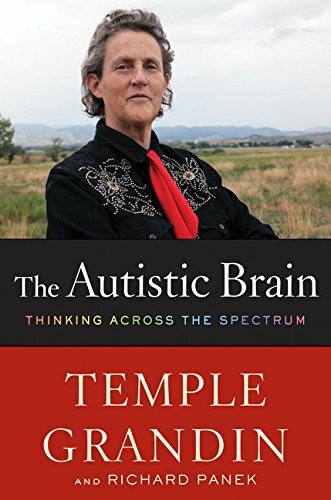 One of the services Temple Grandin renders in her new book with Richard Panek is advocating an end to one-size-fits-all thinking about autism. Indeed, where Part I of the book concentrates on “the autistic brain,” Part II is given to “rethinking” it. Dr. Grandin lays out evidence any reader can follow. A major argument is with the DSM (psychiatry’s Diagnostic and Statistical Manual), whose inclusion criteria and categories per se need rethinking––until much more is known about autism’s cause, or whether the varied behaviors now under the autism label even represent a singular disorder in any fundamental sense. Dr. Grandin would like to find genetic, neuroanatomical, or chemical common ground; however, the range of the autism “spectrum” formalized by the previous DSM–IV (1994) “is part of the problem.” She prefers not trying to label a collection of symptoms, but rather to take each symptom at a time and attempt to match it with biology. What follows is a smart and sensitive analysis of the muddle of autism diagnosis, especially how it has lurched over editions of the DSM without the ever-changing criteria having a bona fide scientific basis. Her own experience and interviews with autistics worldwide tells her that it makes the most sense to assign diagnoses based on one’s main symptom. Changes in this year’s upcoming DSM–V particularly alarm the author in their elimination of 40% of those now diagnosed on the autism spectrum. Denial of health coverage will inevitably follow if one isn’t labeled according to the manual’s imprimatur. Those “Aspies,” a term Grandin uses with evident affection for individuals with Asperger’s syndrome, who have only social impairment and not repetitive behavior, are tossed out of the autism category and moved elsewhere. “Rubbish,” she says. “To my way of thinking, social impairments are the very core of autism.” This of course is the familiar plea of someone with first-person experience to experts who have only a third-person point of reference. To judge by history, the experts rarely heed the practical advice they are given. Inasmuch as an autism diagnosis rests on specific behaviors––“what the experience looks like from the outside: the acting self, rather than what the experience feels like from the inside: the thinking self,” part of her rethinking is to offer ways to identify and either cope with or minimize the assorted visual, auditory, and tactile oversensitivities that lead to outbursts, avoidance, and similar disruptive behavior. By taking into account the stark discrepancy between how some individuals think and how they observe their physical body acting, Dr. Grandin lays out evidence that many nonverbal autistics are far more engaged in the world than observers have assumed. Autistics frequently display both disability and exceptional abilities—the savants, systemizers, lightning calculators, calendar prodigies, and mechanically gifted. Nowhere is this more apparent than in tech communities such as Silicon Valley or Bangalore, which report autism rates 10 times higher than the general population. Engineers, who understand the world in superb detail, aren’t the only technical-minded people who possibly harbor autism genes. Others grasp patterns inherent in nature, technology, math, and music that elude the rest of us. At the University of Cambridge, math students were nine times more likely than humanities students to have a formal diagnosis of autism, while siblings of mathematicians were five times more likely to be autistic compared to sibs in the humanities. Dr. Grandin’s hard won status as a Ph.D. and the world’s most famous high-functioning adult with autism makes her worry about the 50,000 people on the autism spectrum who turn 18 every year in the U.S. alone. Their attention to and obsession with details could be channeled into relevant career skills. For example, airport security screeners whose job requires them to pick out details quickly may easily become bored and fatigued. But Aspies love repetition and resist unexpected change. Aspies love jobs where every day is the same thing, whereas most people loathe that. Similarly, her visual tract is enormous, 400% larger than controls, whereas a visual–auditory connection by comparison measures a puny 1%. Perhaps, she muses, this accounts for the childhood stuttering and speech delay that she described in Emergence. In spite of such thought provoking findings, however, Dr. Grandin reminds us that autistic brains everywhere are for the most part structurally normal. Given the book’s river of information it is perhaps churlish to point out flaws. She overgeneralizes. She is out of her depth when discussing painters and composers. We are told they used patterns and formulas, but are given no evidence to judge for ourselves. There are jarring instances of hyperbole (“Now that, I thought, is a mind-blower,” or “As a biologist, I’m freaking out, it’s so cool”). And she seems unaware of the mechanics of coup-countercoup head injuries: If bopped on the head, the damage lies not directly beneath the impact but 180 degrees opposite it—a rookie mistake for someone discussing the brain. There is more wealth than room to discuss it. In The Autistic Brain Dr. Grandin bores deep into genetic details, discusses the role that high levels of testosterone in the womb may play in the development of both technically oriented and autistic minds, and even takes on the infamous vaccine imbroglio. In all of this Temple Grandin has yet again been of enormous service to the millions of autistic individuals worldwide, to anyone labeled with a disability, and to the rest of us curious about the brain and the intricacies of human experience. For more on this topic read reviewer Richard Cytowic's article The Maddening Normality of Autistic Brains at Psychology Today.